Here's a pic of both my live rigs (each in a 2u rack) and all my -current- rackmount amps. One 2u rack has an MP2 w/a Boss GX-700, the other has an MP-1 Classic with another GX-700. The 'amp rack' has an ADA Microfet, an ADA Microtube 200, and my ADA T100s. The Tower of Power on top of my two 1x12 Thiele cabs. There you have it - a monstrous rig with a footprint barely larger than a milk crate. Cool pics! I'll try to snap some and post here soon! More is always better! We'll, now that I am about to start gigging again, i have had to develop a small rig based on what I have. Soooo...now I am using two tube works tube driver combos (just the speakers) running in stereo after my amp rack. Saves me stage space. On top of that, if my rack fails...instant stereo backup after reconnecting speakers to the tube driver amps. Wow, that looks like a blast, considering GKs guitar pre reputation. Great score! I'm new here with this being my first post . I recently scored my first mp1 , a great steal for 50.00 . I was told it needed a transformer replaced but to my surprise a tube replacement is all that's required as it's been rack mounted for more than two decades in a studio without the tubes being changed . This is my first rack rigg although I've owned several rack mount preamps paired with a number of heads in the past .I'm using a Engl XXL 4/12 stereo cab with an Engl 920 stereo power amp . I also scored a Peavey Rock master preamp ( today) for 150.00 , which the 920 will allow me two A/B switch the two pres . I haven't had a chance to crank it up to live' levels yet as I'm still assembling the setup . 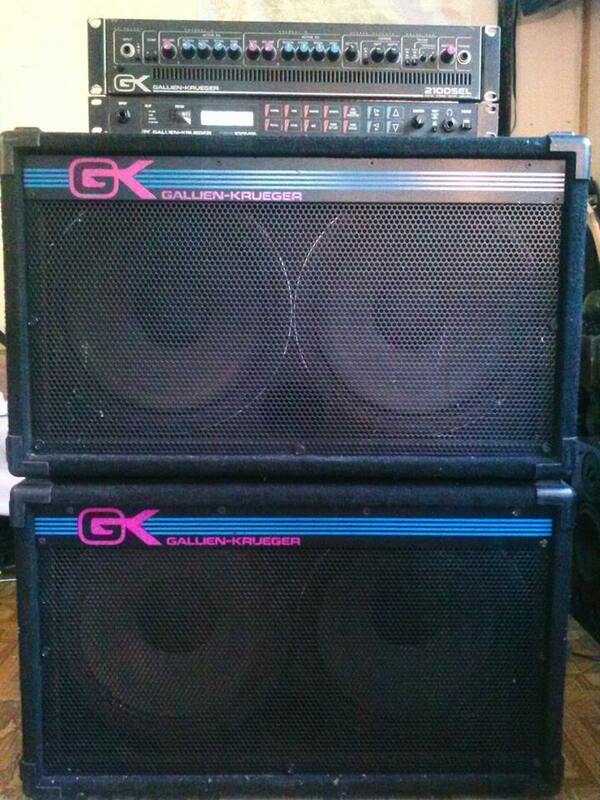 The power amp was also a steal for 500.00 and it came with an SBK 6 space rack case . I'm looking forward to a wall of beautiful brutality and power . Pictures to come when I receive the other preamp . I have a rock master pre, seriously underrated brutal preamp. Just wait till you crank that thing up. Currently running it through a Carvin Tube 100, gets a nice glassy texture. Add to that a great clean channel and you are set. How is the Engl cab? BTW what replacement tubes did you put in ??
. The XXL cab is killer as well as heavy , both tonally and physically . Monster weighs about 63 kilos and sounds amazing , crystal clear leads and a thunderous low that's balanced and brutal . I was using it with a Engl Invader 150 for a couple of years .....sonic heaven ! Now I've gone stereo !
. I'm in the process of deciding , deffinantly looking for a " modern metal " tone from it . I was way into Paul Gilberts Racer X tones as a kid but 80's hair metal tone's not what I need . I have a box around here somewhere with tungsol , JJ and telefunken 12ax7s , if I could only find it ! LOL Any suggestions for tubes ? Hey Dude sounds like you have been finding some KILLER deals like I have been lately! Looking forward to some pics for sure! Take it easy & LONG LIVE THE M-E-T-A-L!